This site is an Art Education website dedicated to helping art teachers excel. This site will facilitate the sharing of resources between students and teachers and provide quality lesson plans inspiring best teaching practices. On top of that, all resources are free. This site has been created to fill a void of staff development opportunities for teachers in public schools. I know. I have been teaching in rural North Carolina for nine years. Currently, I am a high school art teacher in my ninth year of teaching. I have not only taught at the high school level but also at a very diverse Title 1 middle school. 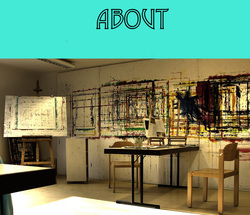 This website aims to assist in the integration of contemporary art within classroom practice. Lessons and classroom prompts are broken down into four major categories: Repurposing, Community, Technology, and Joe's Page. Each category is filled with a lesson title, a short description, and a link that will take you to a lesson. Within each lesson you will find activities to facilitate art making, classroom discussions prompts, opportunities for technology integration, 21st century skills strategies, vocabulary, and art history topics. These activities require few materials and can be adapted easily to the age, grade level, and needs of your students. This website will serve as a station for up to date contemporary art news from various media sources. Feel free to contact me with suggestions and/or comments through the use of the website contact page. free teaching and learning resources. if you have suggestions for other ways that we can assist, we welcome your input here.